Lately I have read yummy books and taken pictures of the garden (mostly the pink buds and then flowers of the Magnolia Tree). I’ve been lazy in the sun most of the time because it was a great hot weekend with birthday party, wine, BBQ, boat ride, friends, eating candy, a new Moleskine diary and movies. 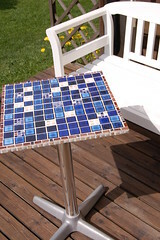 I’ve taken some photos today of the mosaic table I made for my parents last week. It’s blue for mom and made together with and for my dad whose birthday we celebrated this weekend. 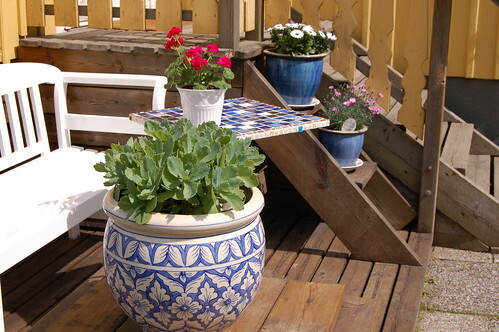 Mom’s blue outdoor pots and it’s a match! I scored a giant box of mosaic tiles in different shapes and colors at a flea market two years ago, and this is the first project with some of those tiles! Dad fixed and painted the board and I did the mosaic part, using both small, medium and big tiles in different shades of blue. Plus a brown border to kind of frame it. I think it turned out okay. I just had to put in the only turquoise tile I found in the mosaic box. It just wanted to be in this project! 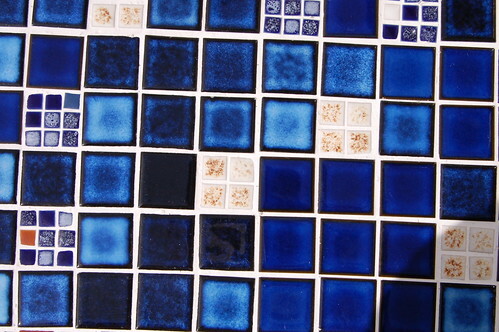 There are plenty of tiles left in my mosaic treasure box. There are bags of all kinds of tiles, some shaped like hearts, others round and there are even some that you can put together like a flower! I think it must be one of my best finds at a flea market ever! What do you think? I think mosaic is fun! My sweet cousin Charlotta is blushing over all the nice things said about her and her lamp right now and I’m blushing with joy over what Jen Lemen wrote about me at Blog Her in a post about blogs from Europe! 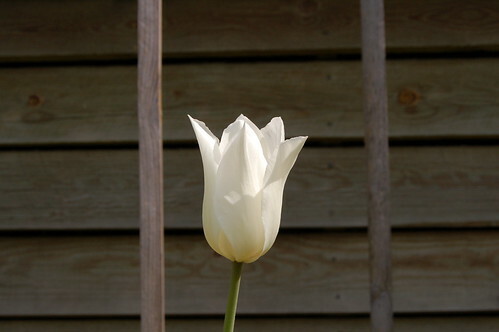 * Today I added Jen’s blog to my list too! I’m also enjoying what came in today’s mail, a book called Patchwork Playthings by Margaret Hutchings that Diane (she is my Craft Fairy I think) sent! This entry was posted in Crafts and tagged furniture, garden, mosaic. Bookmark the permalink. Vilket fint mosaikbord och vilket fynd p? loppmarknaden. I min k?llare ligger det mosaik och krossade kakelplattor och v?ntar p? att f? bli till ett fint bord, men de f?r v?nta ett tag till. Det finns s? mycket annat som jag vill g?ra f?rst. Det h?r ?r f?rsta g?ngen jag kommenterar p? din blogg, men jag har varit h?r och tjuvl?st ett tag. Jag b?rjade f?rs?ka skaka liv i min egen avsomnade kreativitet f?r tv? m?nader sedan, och din blogg var den f?rsta jag hittade n?r jag s?kte efter inspiration p? n?tet. Du har gett mig mycket att fundera ?ver och inspireras av. Tack f?r det! Beautiful mosaic table! You are so crafty! You should be receiving a box in a few weeks. I don’t know exactly how long it will be since it’s by boat. PS I’m having a small giveaway on my blog: an altered CD. 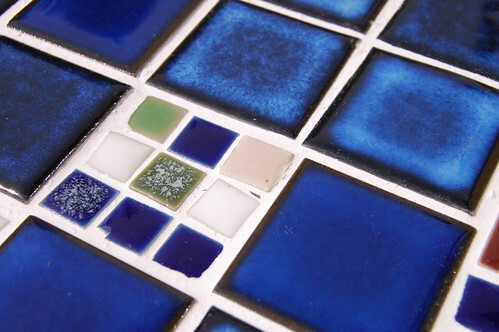 love the great combo of mosaics…really fun! This is so beautiful, cute, gorgeous. I love these blues. This is perfect for a patio in the sun! Blues, greens and browns are my favorite colors so yey! I love it A LOT! 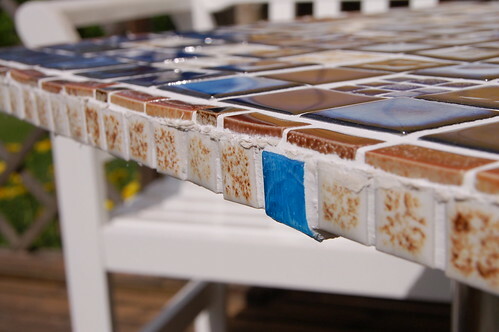 I absolutely love your blue mosaic table! You’ve inspired me to try something like that for my “cozy corner of the deck” also! Thanks so much for sharing! Wowser! Your table turned out AWESOME! 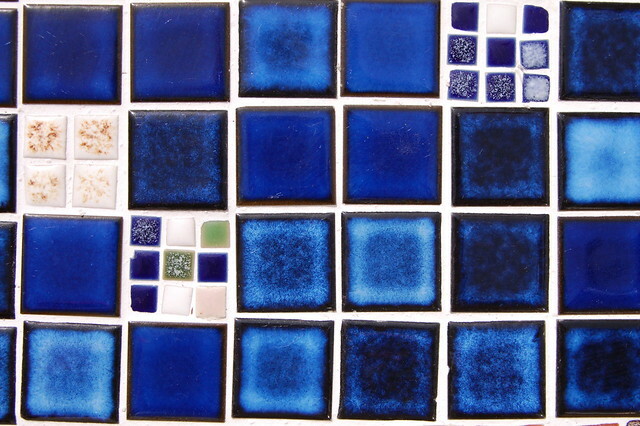 Don’t you just LOVE mosaics?!? !